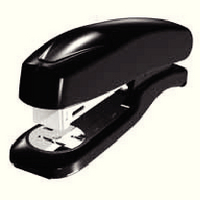 Stapler for the secure and easy fastening of documents. Works on a wide range of lightweight materials. Half-strip stapler for compact and reliable stapling. Ideal for personal or small office use. Approx Dimensions (CM): D11.5 W5.2 H3.5. Approx Weight (KG):0.0951.